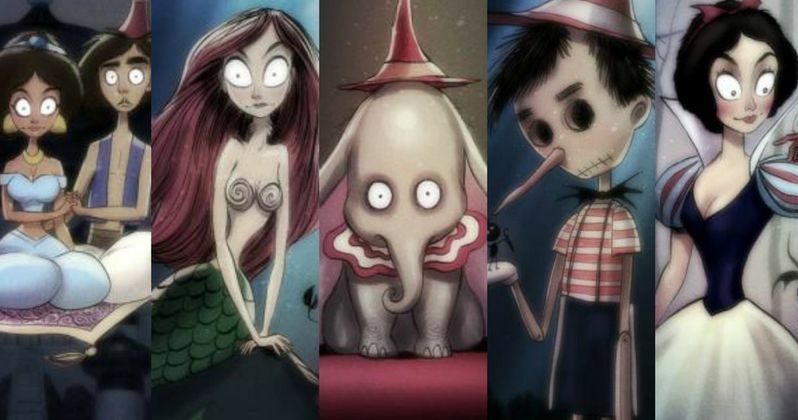 Tim Burton and Disney have a long-standing relationship. He was, after all, notoriously fired by Disney while making the 1984 black & white short Frankenweenie, which would later become a feature-length Stop-Motion adventure for the studio. Before that, he worked as an uncredited animator on the 1981 classic The Fox and the Hound and the live-action 1982 sci-fi cult classic Tron. He has since reunited with the studio to direct the live-action blockbuster smash hit Alice in Wonderland in 2010. And in 2018, he will bestow the world with his live-action/CGI adaptation of Dumbo. But now, one enterprising artist as set out to discover what 10 classic Disney animated movies may have looked like with Tim Burton steering the wheel. Andrew Tarusov, an artist and animator from Moscow, has designed a special set of movie posters. These ten images even include Dumbo as they set out to reimagine and recreate some of the greatest animated movies of all time. Also included in the set are 1938's Snow White and the Seven Dwarfs, 1961's 101 Dalmatians, and 1994's The Lion King, which gets reimagined in the style of The Nightmare Before Christmas. Other posters in the set include one for 1942's Bambi, 1989's The Little Mermaid, 1992's Aladdin, and 1959's Sleeping Beauty, which puts a twist on The Bride of Frankenstein, a favorite of the director's. 1991's Beauty and the Beast and 1940's Pinocchio round out the uniquely designed one-sheets. Dumbo is the final image in the gallery, and offers us a slight hint at what we might expect from the director in 2018. Here's what Andrew Tarusov had to say about his paintings. "[They are] vintage, chic, and cute. His work is often marketed as 'horror' movies, but at the same time, it's not a horror. It could be any genre." Tim Burton declined to return for the sequel Alice Through the Looking Glass, which will be in theaters later this year, but he is still attached as a producer for this Disney live-action sequel. His next film as a director is the adaptation Miss Peregrine's Home for Peculiar Children, which hits theaters this Christmas. And then he will dive headfirst into his take on Dumbo. Until then, enjoy these Disney classic in the style of the legendary director.